My name is Gilbert Mouchel-Vichard, and I have created this website to share my passion for donkeys with you so that you can rediscover this extraordinary, affectionate and, contrary to popular belief, very intelligent animal. For my part, I have devoted these past 20 years to the breeding of the Cotentin donkey , a breed from my region. I have therefore gained considerable experience in the education of this animal and its use. (trekking, harnessing...). 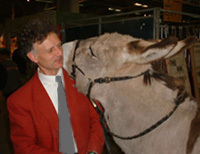 As a matter of fact, I was for 7 years the speaker for the Cotentin donkey to the ministry of Agriculture and stud farms.